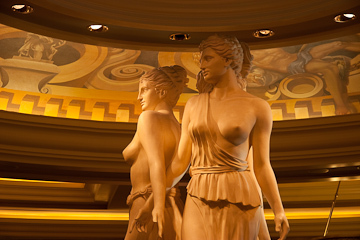 « What’s wrong with Caesar’s Palace? Validation itself is obvious … keep crap out of the database, apply constraints to data fields, give feedback to users. He begins by giving several examples of how constraints are applied to day, down to the DDL in the database which might specify a column length and a “not null” constraint. These constraints are typically duplicated all the way up the application chain, and really bad when the constraints don’t agree! He proposes a uniform way to express a constraint, a standard way to validate constraints, and a bridge for constraints out of Java land, exposing constraints to the outside world. The spec also calls for validating subsets of data fields by specifying groups, or partial validation. The spec defines groups by using interfaces. Clumsy, but workable. Custom constraints can be built out by creating a custom annotation with an expressive name, extending the @Constraint type. You can compose a group of existing validators from the library into a new annotation.